Abbotsford – Coming off a dream season, what do you do for an encore? As far as the University of the Fraser Valley men’s golf team is concerned, you simply regroup, and try to do it all again. The Cascades’ 2017-18 campaign was the greatest in the team’s much-decorated history – they won the Canadian Collegiate Athletic Association (CCAA) national championship last fall and followed that up by winning the Canadian University/College Championship in the spring, with Daniel Campbell taking the men’s individual titles at both events. The UFV men’s squad launches its dual title defence this weekend, as they open the PACWEST conference schedule at the Langara Invitational, running Saturday and Sunday at Quilchena Golf and Country Club in Richmond. Campbell will be back to lead the charge for the Cascades men. The Bellingham, Wash. product’s individual titles at the aforementioned national tournaments were among his team-record five victories last season, and he was named UFV’s co-male athlete of the year (shared with wrestler Brad Hildenbrandt) and the PACWEST’s male athlete of the year across all sports. Four spots on the Cascades’ five-man playing roster on a week-to-week basis are essentially spoken for, with fifth-year Zach Olson and sophomores Kyle Claggett and Ben Whiton joining Campbell. Each has a track record of outstanding success: Olson is a former PACWEST tournament winner and finished T-11 at the Canadian University/College Championship in the spring; Whiton was the PACWEST individual silver medalist and a CCAA All-Canadian as a rookie; and the fast-improving Claggett picked up his first university win at the Walla Walla Invitational in March. The Cascades will choose their No. 5 each week from a group of four players. Third-year Cascade Cody Stewart is back on the team after a two-year hiatus, and he’ll compete with sophomore Jacob Lucki and rookies Dale Christopher and Devin Cutforth. “We’re letting them decide it on a week-to-week basis through qualifiers who that fifth player will be in the short term,” Bertram said, noting that Christopher won this week’s qualifier and will be on the five-man roster for the Langara tourney. UFV will not field a women’s golf team this season – after the departures of standouts Hannah Dirksen (three-time All-Canadian) and Maddie Kapchinsky (CCAA individual silver medalist) from last year’s CCAA gold medal-winning squad, the decision was made to preserve the eligibility of Emery Bardock (2017 PACWEST individual champ) rather than enter her as an individual. PACWEST golf has a new format this year. Rather than cumulative stroke-play totals over four two-round tournaments determining the conference champs, the first three PACWEST events will be stand-alones. The fourth – hosted by Vancouver Island University, Oct. 5-7 at Nanaimo Golf Club – will serve as the PACWEST championship. UFV will host the third PACWEST regular-season event, Sept. 29-30 at Ledgeview Golf Club. 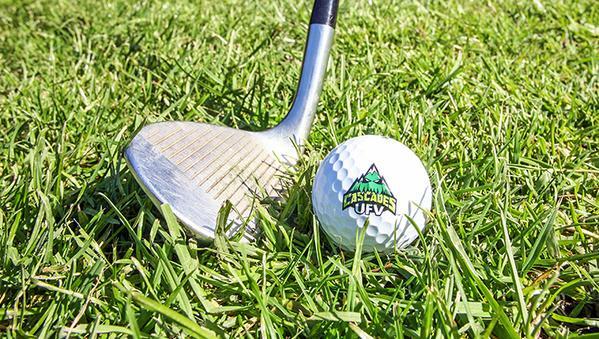 Be the first to comment on "UFV Cascades Men’s Golf Team Launches Title Defence"